with awards presented for the M22ti (left), and the M3ti (right). For thirty years, Axiom Audio has made its reputation by achieving unprecedented performance quality. At inception, Axiom Audio's founder Ian Colquhoun sparked a new period of progress in the annals of loudspeaker design with his work at the National Research Council lab in Ottawa, Canada, under the direction of Dr. Floyd Toole. There he spent innumerable hours perfecting innovation after innovation. The revolutionary theories and methodology resulting from this work were recognized and published in industry journals around the world. Canadian audio engineering gained particularly high status, which Ian Colquhoun and his company have helped maintain ever since. Axiom's reputation grew dramatically among audio aficionados throughout North America. With the emergence of Internet mass communications, Axiom became an extremely popular "secret" among A/V enthusiasts. By emphasizing the practical application of our ongoing research, Axiom continues to extend people's expectations of performance and value. 2013 The LFR1100 Omnidirectional Speakers win a Reviewer's Choice Award from SoundStage Hi Fi. Two new additions to the Omnidirectional Speaker Line Up are introduced. The new speakers take the familiar footprint of the M60 and M80 tower speakers and add drivers in the back, along with Digital Signal Processing, in order to create the seductively big soundstage that the LFR1100s have made famous. A high-powered product line is added to the M60 and M80 tower speakers, as well as the VP160 and VP180 center channels. This addition brings biwiring to the floorstanding speakers, as well as high-powered woofers and die-cast baskets. They come with a new 10-year warranty. The LFR1100 wins a Digital Trends Reviewer's Choice Award, wowing the editors with its addictively large soundstage. The M100 tower speaker is introduced. Long dreamt-of on the Axiom message boards, the 'big brother' to Axiom's flagship M80 speaker immediately becomes a best-seller. The ADA Amplifier series is added to Axiom's product line. These three amplifiers provide crystal-clear dynamics without distortion. There are 27 available configurations in all. The LFR1100 Omnidirectional Loudspeaker is introduced. It's 11 drivers are on the front and back of the speaker - a first for Axiom. 2012 GoodSound! Awards the Epic 60-500 a GoodSound Great Buy Award. HomeTheaterShack.com gives the Epic Grand Master On-Wall Home Theater System an Editor's Choice Award. SoundStage! Network gives Axiom the coveted Product of the Year Award for the Epic 80-800, in the Outstanding Performance category. The VP160 Center Channel Speaker is released. All drivers exactly match the M60 Tower Speaker, creating a seamless soundstage across the front channels. 2011 SoundStageExperience reviews the Epic 80 - 800 Home Theater System and declares it a Reviewer's Choice Award-Winning home theater speaker package. Sound & Vision Magazine gave the M60 v3 their coveted Certified and Recommended award. 2010 Secrets of Home Theater and High Fidelity award the Axiom Epic 80 v 800 The Best Surround Sound Speaker 5.1 System of 2010. The Auction Site is added to the website, enabling users to sell used Axiom gear and buy factory outlet stock. Axiom celebrates 30 years in business. The EP800 DSP subwoofer wins a coveted Reviewer's Choice Award from the SoundStage Network. Axiom introduces the VP180, a 'monster center channel' inspired by customers seeking the ultimate in home theater sound playback. Adding to the 'have great sound your way' ethos at Axiom, the M60 and M80 in-cabinet speakers, designed to fit into custom-built cabinets in a custom home theater. Axiom adds a new line of on-wall speakers and center channels that feature the Power-Mount innovative mounting technology. These speakers are as slim as a flat-screen display and easy to mount. 2009 Axiom introduces the EP800 DSP powered subwoofer, the deepest sub in the Epicenter family. Adding to the already-acclaimed electronics line, Axiom releases a powerful stereo amplifier, the A1400-2, to the lineup. This incredible amp is virtually unclippable and won instant raves. The EP800 DSP subwoofer wins an Audioholics Consumer Excellence Award. Axiom releases the Accent, a compact wall-mounting home theater system with innovative mounting system. The Accents receive a Consumer Excellence Award from Audioholics. 2008 Sound & Vision Magazine gives Axiom their coveted Editor's Choice Award at the Consumer Electronics Show in Las Vegas for the Epic 80 v 500 5.1-channel system. GoodSound! gives Axiom a GoodSound Great Buy award for the M60 Floorstanding Speakers. Criterion Studios seleced the Epic80 v 500 system for installation in their New York Park Avenue screening room. SoundStage awards the A1400-8 Digital amplifier its coveted Reviewer's Choice badge of honor. Axiom debuts the T2, a new almost-invisible audiophile speaker that disappears into the wall when installed. 2007 Axiom debuts its first line of outdoor loudspeakers, the Algonquins, based on the award-winning M3 stereo speakers. Axiom participates in its first Interior Design show, co-sponsoring a model home designed by noted interior designer Brian Gluckstein and equipped with Axiom's latest products for the designer - in-wall speakers, the EP400 high-performance compact DSP subwoofer and paintable and custom real-wood finishes throughout. Axiom introduces its first electronic component, the eight-channel A1400-8 digital amplifier with up to 1400 watts of output, and wins Audioholics Consumer Excellence Award 2007 for it. Axiom introduces the Audiobyte Computer Speakers, the world's first luxury audiophile computer speakers, available in eight finishes. HomeTheaterSpot awards Axiom the Editor-in-Chief Award. 2006 Axiom receives three awards at the Consumer Electronics Show in Las Vegas, Nevada: Product of the Year for the EP500 DSP Subwoofer from Home Theater Sound; Product of the Year for the Epic 80 v 600 Home Theater System from Audioholics, and the Exceptional Value Award from SoundStage for the M80 v2 Floorstanding speaker. EP600 and M80 win two BlueMoon Awards from SixMoons.com - for "Unprecedented Value & Perfomance in the Sub $2,000 Floorstanding Category" and "Unprecedented Performance & Flexibility in the Value-Priced Monster Subwoofer Category"
EP600 Intelligent DSP sub receives a Reviewer's Choice award from Home Theater Sound. 2005 EP500 Intelligent DSP sub receives a Reviewer's Choice award from Home Theater Sound. Axiom installs an anechoic chamber to further research and development at its facility in Dwight. The chamber is an exact replica of the anechoic chamber at the National Research Council in Ottawa, Canada, where Axiom first measured and developed its prototype speakers. Epic 80 v 600 Home Theater System receives an Editor's Choice Award from Audioholics. Axiom introduces its Architectural Series, an on-wall / in-wall hybrid speaker whose innovative design overcomes the problem of boundry effects that previously degraded the sound of most in-wall speakers. 2004 Audioholics.com declares Axiom's new Epicenter EP500 Intelligent DSP sub "Subwoofer Product of the Year." AudioRevolution.com awards the Epic Grand Master a "Best 100 of 2004" award, ranking it among the best products on the market for the second year running. Axiom introduces two Epicenter Intelligent DSP Subwoofers, models EP500 and EP600, which deliver clean, undistorted deep bass to subsonic frequencies (15 Hz) at unprecedented levels of loudness. The M60ti Tower Speaker is awarded the GoodSound Great Buy designation. Designtechnica.com gives the Axiom Epic 80 an Editor's Choice Award with a stunning 10/10 score. 2003 AudioRevolution.com awards the Epic Grand Master a 'Best 100 of 2003' award, ranking it in the top 20 products of the year. During the Consumer Electronics Show 2003 in Las Vegas, Axiom wins the OnHometheater Product of the Year 2002 award for the Epic Grand Master Home theater. The Epic 60 Home theater Award wins a Reviewer's Choice Award from HometheaterSound. Axiom introduces its first line of cables and an innovative new bracket, designed to rotate on three axes for truly flexible mounting. Axiom also comes out with a revolutionary idea - customizable loudspeaker colors with 24 possible finishes and six possible grille cloths. 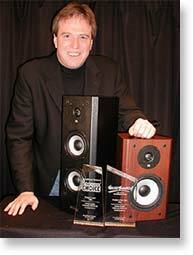 2002 During the Consumer Electronics Show 2002 in Las Vegas, Axiom wins the GoodSound! Product of the Year 2001 award for the Millennia M3ti SE Loudspeaker. At the same event, SoundStage! presents Axiom with the Budget Leader 2001 for the M22ti SE. The newly-redesigned M2i receives the SoundStage! Reviewer's Choice Award. 2001 The Epic 80 Home theater Speaker System receives the Reviewers' Choice Award from Home theater & Sound. SoundStage! presents the Millennia M22ti SE with their Reviewers' Choice Award. 2000 Axiom celebrates its 20th Anniversary. 1999 Axiom adds the Millennia line, including the Epic / Epicenter, Vocal Point, Quadrant Series and Custom Home theater Series. 1994 The AX 3 wins the Critic's Choice Award from Sound & Vision magazine. 1993 Sound & Vision gives the AX 1.5 the Critic's Choice Award. 1992 Sound & Vision's Critic's Choice award won for the Axiom AX 2 Reference Loudspeaker. 1991 Axiom expands an amazing 320%, increasing the capacity of the plant and begins OEM manufacturing. Axiom's AX 2 Reference Loudspeaker winsthe Critic's Choice Award from Sound & Vision. 1988 The AX 1 Reference Loudspeaker wins Sound & Vision's Critic's Choice Award . 1987 The Consumer Electronics Show awards Axiom thecoveted Design and Engineering Award. Sound & Vision magazine presents Axiom with the Critic's Choice Award for the AX 5 Reference Loudspeaker. Axiom begins exporting loudspeakers to the United States. 1986 Sound & Vision presents Axiomwith its Critic's Choice Award for the AX 1.5 Loudspeaker. 1985 Axiom launches AX Series 2. 1983 Axiom moves to Dwight, Ontario, Canada. 1982 Ian Colquhoun joins National Research Council project in Ottawa, Canada, whose aim was to standardize the measurement of loudspeaker sound. 1981 Axiom introduces AX Series 1. 1980 Axiom Audio Canada is formed by Ian Colquhoun. 1979 Ian Colquhoun builds his first set of loudspeakers in a friend's garage and another friend asks to buy them immediately. The idea germinates. . .